The Odiham Society’s original hand written minute book covering the period 1783-1796 (16494-1001). One of the most important items in the RCVS archives is the original minute book of the Odiham Society. The minute book, which was acquired by the RCVS Registrar Mr WGR Oates in 1956, allows us to trace the beginnings of the veterinary profession in Great Britain. 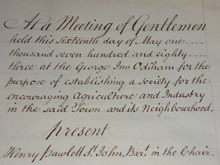 The Odiham Agricultural Society first met on the 16 May 1783 at the George Inn, Odiham "for the purpose of establishing a society for the encouraging of agriculture and industry in the said town and its neighbourhood." In the minutes of 19 August 1785 it is recorded that it was resolved "that the Society will consult the good of the community in general, and of the limits of the Society in particular, by encouraging such means as are likely to promote the study of farriery upon rational scientific principles’ and to ‘consider what means may be most likely to encourage the study of scientific farriery." Following this the Society set up a farriery fund with the intention of sending two or more boys to study at the veterinary school in Alfort near Paris. Before the boys could be sent to Paris, a member of the society, Granville Penn met Charles Vial de St Bel and discussed with him St Bel’s plan to establish a veterinary school in England. in this country such an institution for education in farriery is necessary." and a London Committee of the Society was formed, meeting for the first time in November 1790. The resulting school, which opened in 1791, was called the "Veterinary College, London" with St Bel appointed Professor. To view this, or any other item in the archives, please contact us at archives@rcvsknowledge.org or 020 7202 0752 to arrange an appointment.